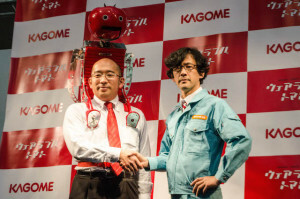 Mr. Suzuki is an employee of Kagome (カゴメ) and is also an agriculturist. One day he thought, "Tomatoes are perfect for sports. But why we don´t eat tomatoes while we do sports. Oh, tomatoes are lack of mobility." This was the beginning of the wearable tomatoes, Tomatan project. Mr. Suzuki brought this project to Meiwa Denki (明和電機). 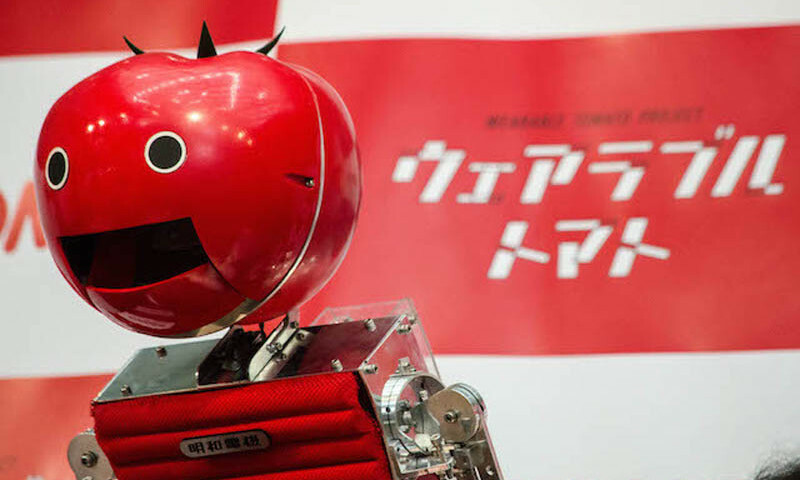 Meiwa Denki is an art unit who has been inventing unique toys and machines. They also perform music. I think collaborating with Meiwa Denki for Tomatan was the right decision for Mr. Suzuki. 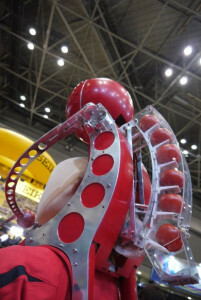 Tomatan is a backpack form tomato-distributing machine that makes you easier to carry up to six fresh tomatoes to eat while you are running. Kagome made this public just before Tokyo Marathon. Why tomatoes? Tomatoes have a high antioxidative effect and help you to hydrate. As an agriculturist, Mr. Suzuki had noticed that tomatoes are better than banana for athletes. 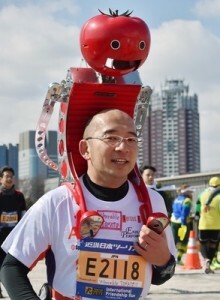 The day before Tokyo Marathon, on the 21st of February, there was an event, International Friendship Run and Mr. Suzuki participated with Tomatan for the promotion. This is the back of Tomatan. It weighs 8kg. After the first run, Mr. Suzuki noticed some problems with the machine. "The tomato fell" , "The stem was facing to the mouth", "The machine wasn´t so stable on the shoulders", "Too heavy and it got into the shoulder. It was painful". Comfort was the biggest theme. Mr. Suzuki was going to try a smaller model of 6kg with 12 tomatoes for Tokyo Marathon, which was held on the 22nd of this month. I haven´t seen the result yet but it definitely caught attention of the media around the world. If you are a jogger, would you carry Tomatan?